Honor and Values - Your Cadet will live under the Cadet Code of Honor which states that a Cadet will not lie, cheat or steal, nor tolerate those who do. Your Cadet will also be expected to live by our values of Courage, Respect, Integrity, Service, Loyalty, Truth and Wisdom. Value - Your Cadet will live in a contemporary Cadet residence hall, eat in a modern dining facility, work out in a cutting edge fitness center, study in a state-of-the-art library/technology complex, and be a part of one of the top Army ROTC programs in the nation. Leadership skills and minor - Your Cadet will be placed in leadership positions of increasing responsibility as he or she progresses through the program. By accomplishing a couple of simple steps, graduates of the Corps of Cadets can receive a leadership minor. Least expensive Senior Military College - Compare our cost to any other senior military college. Our costs are comparable to most four-year public universities. Safety - Our campus is incredibly safe. We have a professional campus police force on duty 24/7. Graduation rate - We are in the top five public colleges and universities in the State of Georgia. Physical Fitness - Your Cadet will participate in structured, group physical fitness training three days per week. No Drugs or Alcohol - UNG is a drug, alcohol, and tobacco free campus. UNG is Committed to Student Success! Tutoring services in a variety of subjects are offered free to students! With more than 54 bachelor’s degrees your son or daughter can find a program to fit their interests, skills and goals! The Office of Career Services can help your son or daughter in the job search, including bringing potential employers on campus through job fairs and recruiting visits. The Money Management Center can help your student manage their money during college, and give them tools to prepare for the challenges of life after college. December 2016 - Kiplinger's ranked us in the top 100 best values of all public colleges in the nation. Two other universities in Georgia were on the list: University of Georgia and Georgia Tech. September 2016 - Ranked 24th among public universities in the South in the 2016 Edition of Best Colleges by U.S. New & World Report. 2014-2015 Academic Year - Number 1 Ranked Army ROTC Cadet in the Nation. September 2015 - Ranked 21st among public universities in the South in the 2015 Edition of Best Colleges by U.S. New & World Report. May 2015 - UNG Dahlonega Campus ranked safest college campus in Georgia. October 2014 - Ranked 25th among public universities in the South in the 2014 Edition of Best Colleges by U.S. News & World Report. Also ranked as the best public regional university in the South for the least amount of debt load for the class of 2013. July 2014 - Money Magazine's top 5 public universities in Georgia in 2014 for educational quality, affordability and career outcomes. Carnegie Basic Classification of Master's Colleges and Universities (larger programs). July 2014 - Dahlonega was selected as a top 10 weekend retreat! March 2014 - Kiplinger's ranked us in the top 100 best values of all public colleges in the nation (forth consecutive year). As well as Number 1 for lowest student debt at graduation! December 2013 - Kiplinger's ranked us in the top 100 best values of all public colleges in the nation. Three other universities in Georgia were on the list: University of Georgia, Georgia Tech and Georgia College and State University. September 2013 - UNG is ranked 22nd among public universities in the South in the 2014 edition of Best Colleges released by U.S. News and World Report. 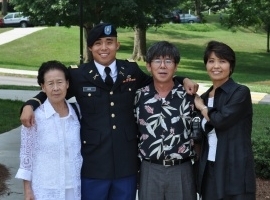 The Parents & Family Association invites parents of prospective cadets to join the UNG Family by getting connected through our email lists, website and Facebook page. Parents of admitted high school students committed to enrolling in the UNG Corps of Cadets may also participate in a closed Facebook group. For information, email the Parents & Family Association Cadet Parent Representative at parents.association@ung.edu.